Simply use the search box above to check fast boat seat availability, prices and to book. NOTE: Online bookings cannot be made less than 24 hours from departure. You will receive immediate e-tickets once you have completed the quick and easy booking process. The boat carrier will also send you an extra confirmation (detailing pickup and drop off information where applicable). To see the current schedule and route map for each boat service, take a look at the individual Fast Boat pages. We hope you have a great trip! Gilitickets offers the best of budget services from Bali to the Gili Islands and Lombok. For premium comfort services, head over to www.ticketfastboat.com. Most of our featured boats depart from Padang Bai harbour in east Bali. This is about a 1hr30min drive from south Bali locations such as Kuta and Denpasar airport. Free pickup is provided from most areas in south Bali and central Ubud. Services depart in the morning and early afternoon. If you want to make use of free airport pickup, the latest possible flight arrival is 10.00am. Otherwise you can catch the last boat by taking a taxi from the airport if you’re out of arrivals by 10.45am. Any later and you’ll need to stay the night in Bali. The shortest sea route from Bali to the Gili Islands and Lombok is from Amed in northeast Bali. 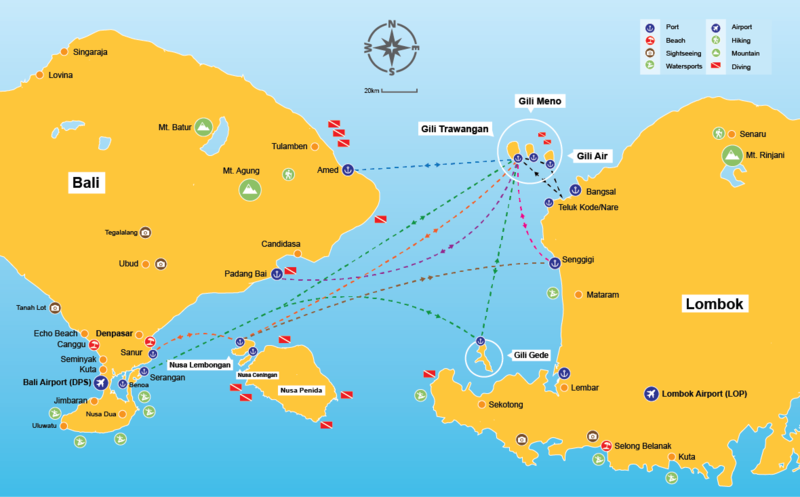 The sailing time from here to Gili Trawangan is just 45mins in optimal sea conditions. However, it is important to note that Amed is quite remote, and a long road journey away from most popular tourist areas in Bali such as Kuta, Seminyak, Sanur, Nusa Dua and Ubud. We therefore advise booking an Amed to Gili departure only if you are staying in north Bali or the Amed and Tulamben area. We feature 2 trusted services from Amed to the Gili Islands: Kuda Hitam Express and Pacha Express, which you can book easily by using the search box on our home page. You must select Amed as your departure location to see these appear in the results. Most fast boats leave the Gili Islands/Lombok around midday, with an estimated journey time back to Bali Airport of 3-4 hours. If your flight leaves later than 8pm, any service should get you there on time. NOTE: boat operators are not liable for delays/missed flights. If your flight leaves earlier in the day, we suggest scheduling your boat trip back to Bali a day prior to your flight, and spending the night on Bali to avoid any risk. Stay at a hotel close to the airport, in or around Kuta, Sanur or Seminyak. Plenty of local transport is also available from Bangsal Harbour in north Lombok. Tickets are available on arrival in the harbour, walk past all the hawkers to the ticket office for the best deal. Bangsal is 2hrs drive from Lombok airport. From the Gili Islands going to Lombok, tickets for public ($5) or chartered ($35) boats can only be bought from the office on each of the islands. All the fast boat services offer free hotel pickup and drop off to/from the harbour, within certain popular zones (Kuta, Sanur, etc.). For info on which, check the fast boats pages and/or the boat info within search results. Depending on which fast boat and departure point you choose, the free transfer areas will vary. When you perform a search using our homepage, simply click on the ‘boat info’ link provided in the search results for the specific coverage info for each boat carrier. Our featured fast boat services from Padang Bai to Gili Islands/Lombok also include free transfers from/to central Ubud. 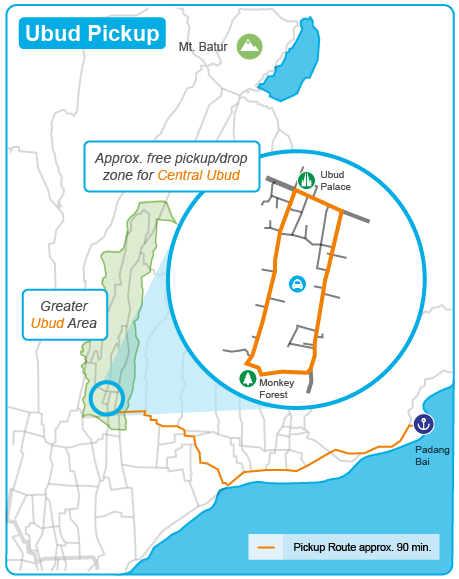 This is a very limited area, with many hotels and resorts for Ubud far outside the central pickup zone (see image). Check your hotel address on a map to see if you can expect free transfers. If your hotel isn’t inside the free zone, you can simply request central pickup/drop during the online booking process and take a local taxi the rest of the way. Note: A lot of the budget boat companies are even starting to limit the Ubud pickup exclusively to Ubud Palace. If you want a boat departure from Amed, please note: transfer services are only free in Amed & Tulamben area (far northeast Bali), so transfers from elsewhere will incur significant charges and are likely to involve a very long drive. We offer multiple departures with Eka Jaya, D’Camel and Rocky Fast Cruise to/from Serangan and Sanur in south Bali. If you want to stop over on Lembongan en-route to or from the Gili Islands, book the Island Hopping ticket with Eka Jaya. Simply use our search box from Bali to the Gili Islands (or the reverse). Select Eka Jaya ‘island hopper’ from the results (this ticket type includes an optional free stopover on Lembongan). Once you have made your booking, we will send you immediate e-tickets. Eka Jaya will also confirm within 48hrs. Please reply to them in a quick email to let them know how long you’ll stop over on Lembongan and the date you wish to continue to your final destination. They will then reconfirm this at no further charge. Any further questions? Check out our FAQ page for all common issues and info on our cancellation policy, terms & conditions. If you want to know what the Gili Islands and Lombok have to offer, take a look at the excellent travel tips on our sister site.